Rowdy was born 11-months ago and he has traveled well over 11,000 miles by plane, train and car for "trips." We're no experts -- having one child for less than a year and taking him a few places doesn't qualify for anything. But. These things helped us along our way during a dozen flights and 24-hour drives with an active baby, so I wanted to share in case they may help someone else, too! There are many great posts on traveling -- a many more specific than mine ("Traveling internationally," "Traveling with multiple toddlers," "Flying with kids," etc) -- but I'm tossing my vague two-cents into the piggy bank. I recommend three hour chunks at a time on an airplane. If your destination is more than three hours away, I recommend choosing a route that gives you a spacious layover. Once you get to hour four, five, six on an airplane with an active small person… you're asking for trouble (in my opinion). If you're driving long distances the same thing applies: three hours max before a little break. This past trip we were gone for six weeks, and we took three suitcases. That's not necessarily "light-packing" but considering I had bridesmaids-duties in cool Vancouver spring (including dress, heels, Caleb's dress shoes, jackets, etc) and then sunny, warm vacation in southern California with beach towels, and I had all of my camera gear since I had work there were a few different climates to take into consideration. It amounted to each of us having our own suitcase. And the air-tight plastic bags (you know the ones on infomercials?) were really a life saver. I bought Sharper Image bags two from TJ Maxx for $9 to test the waters and see if they worked. To our delight, they really do save quite a bit of room. When traveling it's so nice to have both hands 100% free. I love my diaper bag and when I'm putting around town it works great. But when traveling, we've found, it's super convenient to leave the bag at home and use a back-pack. Caleb and I each had our own. So whether trudging through sand with beach gear, wandering and elbowing through Disneyland, riding trains, touring cities, going through airports, and more. The backpacks were our carry-ons, purses, diaper bags, grocery carts, laptop cases and lifesavers. Honestly, I don't know what I would do without a "baby-wearing device" for airports. Rowdy likes an Ergo "fine" but for the most part he wants to roam around. He likes seeing things, putting his hand out to touch plants/animals/legs, and having a little space to "play" so strollers are great for us. BUT. There are just times when he HAS to be restrained. We do take our stroller through security, but we basically just us it as a luggage dolly ;) Rowdy gets in the Ergo the moment we get out of the car at the airport, and stays in during check-in, through all of security, gate-finding, boarding and sometimes flying (especially if he's fallen asleep). He can throw whatever fit he wants -- he can't get out, and I have my two hands to re-pack the laptop, put on my shoes, dig through a bag to find our boarding passes, etc. I'm telling you: two hands. Travel with two hands. It makes a world of difference. With luggage, other people's car (or rental cars), airports, crowds, buses/shuttles, small hotel rooms, and the like it made our life far easier to have a small stroller that could fit in an overhead bin on a plane (we never put a stroller there, but I'm meaning size: small enough to fit in that sized space.) Sometimes there wasn't room in the trunk for a stroller, but with a small one it can fit in the back-seat or across the back floor board. It's helpful to know you can squeeze into small spaces, have some storage space, and can toss some crap onto it's handle or seat without the stroller falling apart ;) We have a Cybex (it's our only stroller, and one of the few travel system "umbrella"/lightweight strollers. I have been very very pleased -- someday when there is more than one child we'll probably get a CitySelect). If we had a more "all-terrain"/large regular stroller I would probably have bought a smaller second stroller like Maclaren (hands-down the best lightweight strollers.) for these travels. You know that feeling when you've been shopping for a little while? The stuffy, tired, swirling-head feeling? It's kind of laughable how quick that experience is remedied by taking off a layer and getting something cold to drink. It's easy to overheat and then become ooooverwhelmed on accident. I think the same goes for traveling with kids. Stay cool. Stay calm. Go slow. 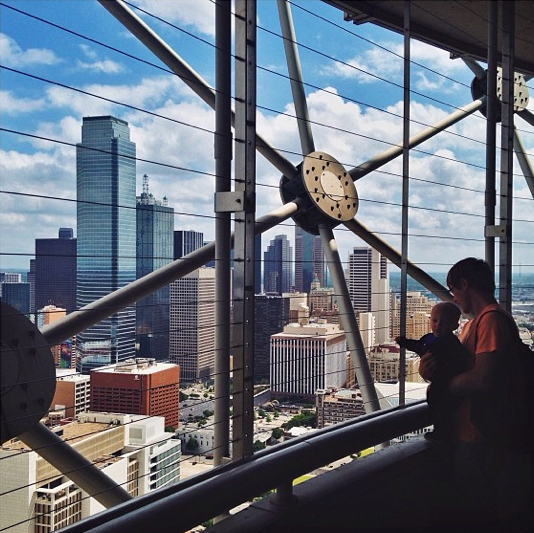 Don't try to set any super-mom records about getting through security the quickest. 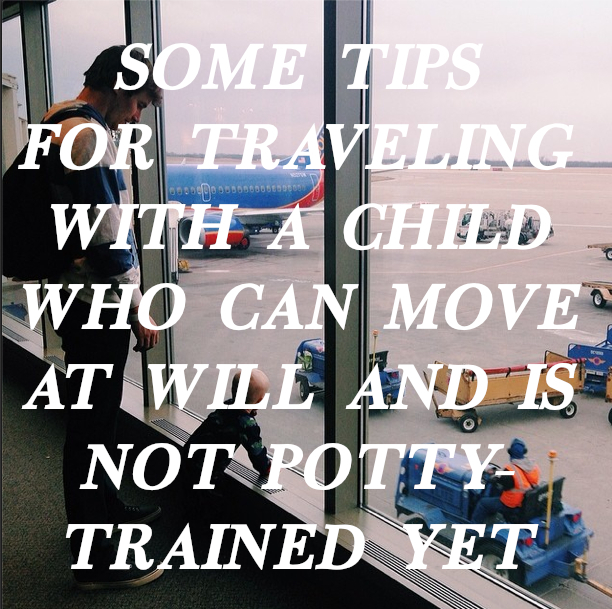 For the most part people are helpful or neutral when it comes to children traveling. Most try to stay out of the way and carry on with their agenda (like when a Student Driver is on the road?) I think our kids can sense when mom and dad seem especially rushed, snappy, overwhelmed and it can sometimes rub off on them. (Ps: kids will lose their bleep-bleep minds when you're calm, too. It happens. But, handling a Hulk-baby-horror while calm is easier than handling one while overheated with a boiling blood pressure.) We've tried to give ourselves plenty of time -- I'd rather let Rowdy run around for an hour at Gate 12 than be gritting my teeth in a long line because we're going to miss our flight. We try to talk with him and to him like "normal," and tell him about what we're doing, give him kisses, let him know we're aware of him even in the chaos of an airport. It's not a magic trick, but being emotionally stable and going physically slow do help. A lot. So do cookies. We recommend planning your trip in such a way that your only "agenda" on the schedule for travel days is: traveling. If I'm flying solo or with Caleb we can fit an entire day into a few hours when we arrive at a new destination! But with a baby, my vote is to just arrive. It's more of an expectation thing: if you fly/drive, check into a hotel/someone's home and you find everyone is feeling pretty nice and the baby is handling himself well, sure! Let's go get dessert somewhere! Or go for a walk on the beach! Or try this restaurant I'd been eyeing! Or whatever. It's like a nice little surprise that worked out. To me that feels better than having a thick plan for the day, and then feeling bummed when the rental car shuttle took 45 minutes, and then the rental car place took an hour, and then it was rush-hour and NOW WE HAVE TO CANCEL OUR PLANS. It just doesn't start the trip on the loveliest note -- and something always happens. I hope somewhere, sometime this helps someone! And at the very least it'll keep a record for me. Enjoy your business trips, fun vacations, family visits and adventures!